Well, all I can say is I lasted the recomended 6 weeks. Almost. I know, it’s nothing like the 6 MONTHS the phisiotherapist recomended I wait, but I swear someone would have lost an eye or a limb if I didn’t get out of the house. 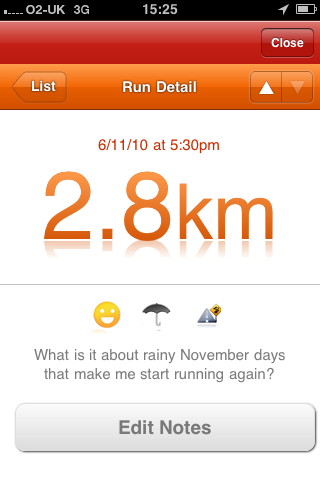 I was trying to wait, but this cold wet November evening I couldn’t take it any longer and put my trainers on and ran. Sorta. I more jogged till I wanted to walk, walked for a bit then jogged a bit more then spluttered along trying to look a little fitter than I am and returned to a walking pace. I guess you can tell that by the fact it took me 30+ min to get less than 3KM! Still it’s a start, and if I ever needed proof of the stress busting results from running then this was it! I’m going to do more on Tuesday. I just need to work out how to fit it into my hectic schedule, I may have to go at the crack of dawn, after the Little Lads 5am feed. Yikes. All I can say is this: I’m annoyed. The app seems to work just as well as the £20 kit, and it’s almost impossible to loose (I have lost a fair few phones in my time) and only costs £1.79… think of all the lattes I could have had! I have only used it once, so it’s possible that it was a fluke & the app is a load of rubbish, so give it a couple of runs & I’ll let you know. But for now it seems good.